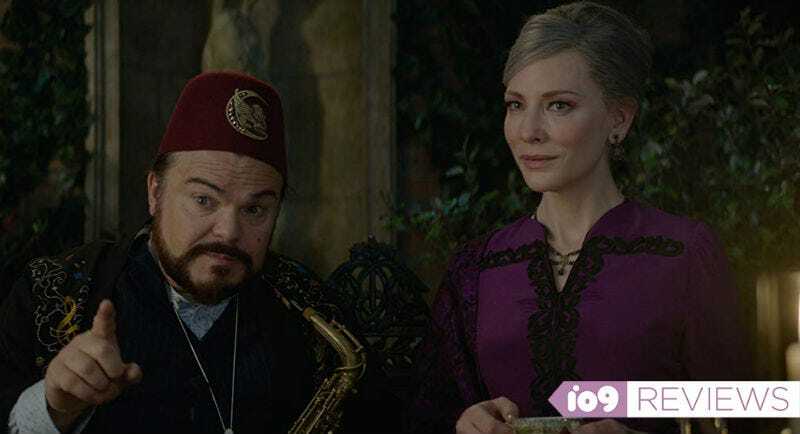 Jack Black and Cate Blanchett are great together in The House With a Clock In Its Walls. The rest? Not so much. Sitting down to watch The House with a Clock in Its Walls, you know exactly the movie you want to see. A fun, exciting, kind of scary but whimsical adventure with great visual effects, fun characters, jokes, chills, thrills—all of that. The actual film has some of those things, but not enough to make it truly worth your while. Based on the 1973 novel by John Bellairs, The House with a Clock in Its Walls is set in 1955 and centers on an odd but smart young boy named Lewis (Owen Vaccaro). Lewis’ parents were killed in a car accident, so he goes to live with his uncle Jonathan (Jack Black) in an old Gothic house. Jonathan’s neighbor Mrs. Zimmerman (Cate Blanchett) hangs out there too, and soon, Lewis realizes the best friends both know how to use magic. Eventually, he starts to learn as well—and together they try to solve the mystery of the title, which involves dark wizards played by Twin Peaks’ Kyle MacLachlan and Hamilton’s Renée Elise Goldsberry. Eli Roth, the man behind the very adult Hostel, Cabin Fever, and Death Wish, directs here in what’s obviously a far cry from those hard R-rated movies. In fact, this is his first PG-rated movie, and it’s produced by Steven Spielberg’s Amblin, a company that once thrived on family-friendly, but slightly edgy movies like E.T., Gremlins, and Back to the Future. Those movies are obviously what Roth tries to channel here, but in doing so, he seems to go a little too far against his instincts. The House with a Clock in Its Wall feels a bit like Amblin Lite, a further watered down version of those ‘80s classics. Blanchett, Vaccaro, and Black make a fun grouping. The fact of the matter is The House with a Clock in Its Walls simply isn’t that exciting. It’s set in a world of magic and wonder that rarely feels magical or wonderful. It’s a world in which a person can bring someone back from the dead and then immediately go to bed, and where a chair can have a personality but not do anything of significance. Almost everything in the movie, even the CG creatures, somehow feel grounded, which tends to undercut many of the more fantastic elements. A few scenes, like a patch of killer pumpkins, work as intended, but that’s the exception, not the rule. Then there’s the story itself, which feels almost like an afterthought for most of the film. The story amounts to “Where is the clock?”—with a few tangents explaining why that’s significant. 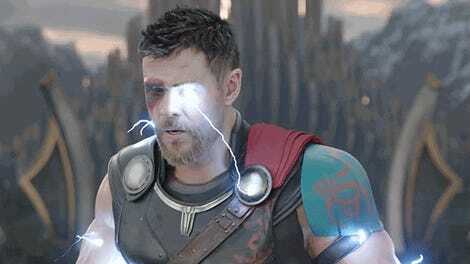 Those tangents, however, are the best parts of the movie because that’s when it really gets into the history and tries to explain this world. Unfortunately, the bulk of the movie is the very well-traveled road of an out-of-place young boy being bullied, making new friends, and trying to find his place. There’s very little about this story we haven’t seen before. Owen Vaccaro holds his own against some Hollywood heavyweights. All of that sounds overly negative, but really The House With a Clock In Its Walls is not bad. It’s just bland. There’s an undeniable, very simple pleasure in watching what’s unfolding on screen. It’s just fleeting. Some of the best bits are the film’s technical aspects, which are marvelous. The period setting, masterfully crafted by the film’s production designer Jon Hutman and costume designer Marlene Stewart, is rich and detailed. The actors also seem to be having a lot of fun with their big, broad, characters. Black and Blanchett have a kinetic, hilarious chemistry as people who are such good, close friends, they spend the entire movie brutally razzing each other. Vaccaro is a relatable protagonist as well, really selling his wide-eyed wonder and discovery throughout the whole film. Of course that journey of self-discovery ends up connecting to the mystery of the house, and eventually grows into something bigger. You’ve seen Amblin movies before, so you know how this works. And those moments, coming at the end of The House With a Clock In Its Walls, really shine in a way the rest of the movie doesn’t. That, in turn, makes them a little sad because they’re proof this concept and team could have made something magical. Instead, it’s just a little too flat and forgettable. The House With a Clock In Its Walls opens Friday.